Part I of the What You Need To Know About Your Bones series covered simple facts about osteoporosis that you should know today. Part I will help you understand why it is so important for you to learn more about your bones today. Click here if you missed Part I of this series. There are two types of bone: trabecular (spongy) and cortical bone. Trabecular bone is spongy and porous. Trabecular bone is where your bone marrow is found and also where your blood cells are produced. Because it is so porous only about 20 percent of all of your bone mass is trabecular type of bone. Cortical bone the hard part of your bone; is the protective, tough outer layer of your bone. Cortical bone is the more “calcified” part of your bone. About 80 percent of your bone tissue is cortical bone since it is more compact. Your arms and legs are mostly cortical bone. Your hips are about 50 percent of each, cortical and trabecular bone. Your spine, jaw and the lower two-thirds of the wrist are mainly trabecular bone. Since your trabecular bone is more porous it is more prone to bone loss which why you most often hear of people with osteoporosis fracturing their wrist, spine or hips. Your bones, ligaments tendons, fascia and muscles are your body’s support structures. Their primary job is to keep you standing up right. When your support structure system is properly aligned your movement is more graceful and pain free. When your posture is poor, for example your shoulders are hunched forward because they are tight in the front due to sitting and driving, talking on the phone, looking a computer screen, hiding your chest, protecting your insecurities and so on, your hips will eventually become tight as well. But even more important, your bones that are misaligned rub against each other at the joint and that is where arthritis, pain and injuries begin. Arthritis is not a “typical” result of aging. Instead, arthritis is an injury of misalignment. It’s caused by your bones rubbing together and hitting one another for years and years. Your bones are made to be strong enough to withstand hundreds of pounds of pressure AND at the same time to be flexible enough to withstand twisting and odd movements without breaking. The flexibility in bone is because of the living protein collagen matrix that makes up about 23 percent of all of your bone matter in your spongy (trabecular) bone. Collagen is the same stuff that makes your skin elastic, thick and healthy looking. More about collagen in Part III, Nutrition & Your Bones. Your bones are built, broken down and remodeled again (slowly over time) throughout your life. The process is effortless and highly effective, if the right ingredients are part of your lifestyle. To make this concept easier to understand, think about rebuilding your house. You need both a demolition crew and a construction crew. The demolition crew breaks down the old worn out structures and the construction crew rebuilds a stronger new structure. Bone metabolism does this same thing. Inside of each of our 206 bones are cells that continually break down and cells that continually rebuild the protein framework made from collagen. Minerals taken from our blood are attached to the matrix (framework) and then harden into bone. In our youth, as we are developing, the bone builders (osteoblasts) stay ahead of the bone demolition cells (osteoclasts). In one year’s time approximately 20 percent of an adult’s bone mass is recycled and released into her blood stream for use by cells, and then recycled and replaced as our bones continually undergo breakdown and renewal in response to the body’s needs. Bone develops at a rapid pace beginning in the uterus and continues developing at a fast rate throughout young adulthood. Your bone building rates are much faster than your bone demolition rates until about somewhere between ages 25 and 32-years when your bones reach their maximum size and density. This is called peak bone mass, the most bone you’re going to have. A woman may lose up to 38 percent of her PEAK bone mass over the course of her lifetime, while a man may lose only 23 percent. Bone loss varies among women due to their lifestyles and genetics. It’s important to remember that if you don’t reach your peak bone mass potential, as you age, you will be losing bone from an already low supply. That’s a problem. All of our modern day comforts and habits add up and each takes just a little bit from a young woman’s bone development as well as her overall health. Over time the comforts and expectations of our our modern lifestyle, such as lack of exercise, over exercise, smoking, too much alcohol, lack of vitamin D, highly processed poor diet (that includes eating out), anorexia and bulimia are adding up and many younger women are not reaching their peak bone mass. When your bone regeneration systems are healthy, a broken bone can be “healed” and the new “repaired bone” will be as strong as it was before. It generally takes four to six months for a broken bone to fully heal. But, as we get older the balance can shift to where the bone building cells cannot keep up with the bone demolition cells. If you have a strong architecture of bone, the deceleration of the bone-building cells is okay. However, there are many factors that can also lower the quality of the architecture of your bones and as you age. In the case of osteoporosis, old bone cells are deteriorating faster than new bone cells can be made (Low bone mass) from bone architecture that is already thin and brittle (weak bone mass). Here’s some good news, if you’ve been diagnosed with low bone density it doesn’t mean that you are doomed to fracture your bones. The difference between bones that fracture and those that don’t depends BOTH the bone architecture and the repair capacity of your bones. Research has shown that a vertebra (the small bones that make up your spine) that has lost 50 percent of its bone mass is still strong enough to withstand five times the strain load that it would normally be subjected to. This means that a woman diagnosed with low bone density can live without ever fracturing a bone. This doesn’t mean that a woman with low bone density is exempt from fractures but instead that there are other factors that also matter. The quality of the bone architecture (structure) is vital. 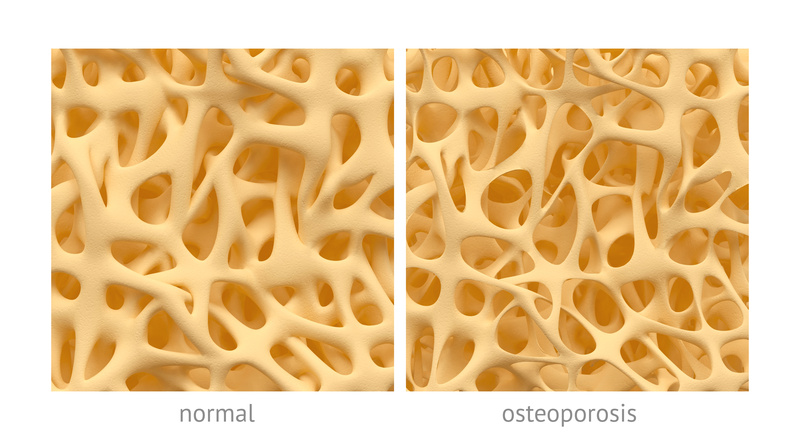 Low bone density (of low bone mass), can lead to osteoporosis. But it doesn’t have to. Osteoporotic bone doesn’t have more space; it just has a weaker structure. Perhaps an easier way to think about the matrix of bone would be to compare it to the architecture of a home. Which home would you want to be in during a Level II hurricane? 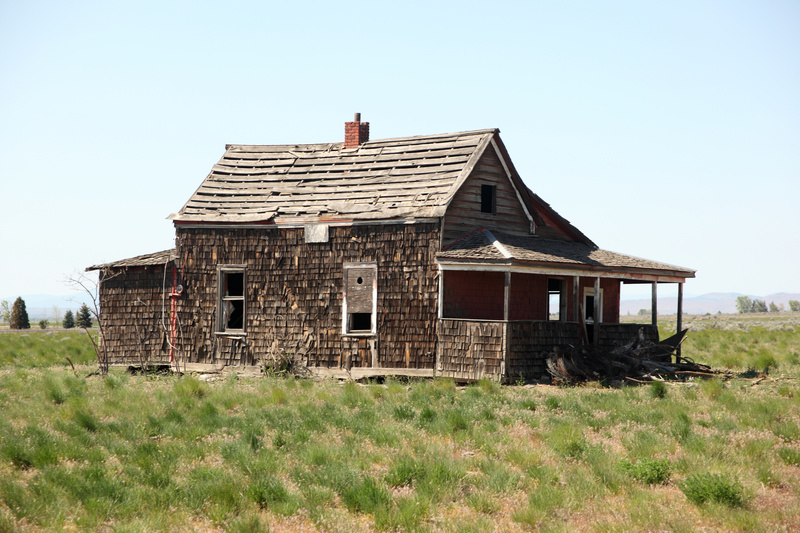 The structure of these homes is what makes them strong…..not the space inside. Your bone quality is dependent on your lifestyle choices EVERY DAY such as exercising, maintaining a NOURISHING clean diet, keeping your insulin levels in check, getting a little bit of sun (vitamin D) and not eating a ton of acidic foods, processed foods. Think like this; we all know that brushing your teeth is important to keep your teeth. But if you brush you teeth when you “feel like it,” you will have no teeth by the time you are 40 years old. That’s why we brush and floss our teeth everyday, EVEN on the days you don’t want to. The same is true for the rest of your bones! Nourish them with high quality food and move them everyday. Bones constantly remodel themselves to adapt to physical stress and strain. But you have to provide the need/stimulus! Your bone building and demolition cells (osteocytes), respond to strain placed on your bones by replacing old worn out (weaker) bone tissue with new strong and sturdy bone tissue. 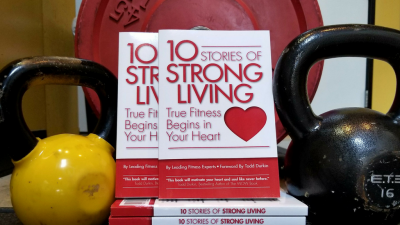 Strain is created through movement, lifting, jumping, climbing stairs, kneeling down to pick up your children or grandchildren, stepping over your dog, and by lifting heavy objects like dumbbells, sand bells, kettle bells and bags of groceries and boxes in your own home. Like every other cell in your body, ALL of your bones are functionally connected to one another. A tight ankle will eventually affect your hips, which will eventually affect your shoulders. This also means that a creating “strain” on the bones in your leg, for example during a squat, not only helps to build your leg bones, but also helps determine the bone density in your spine which can effect the bones in your shoulders, and so on. Regular stress on your bones is absolutely essential to maintain strong bones. It comes down to the very simple but powerful concept of “use it or lose it.” This concept is VERY well documented. When astronauts, who are essentially weightless in space, come back to earth their bone density is significantly reduced because they have been weightless for so long while in space. The human body is EXTREMELY efficient; it is designed to only use what it absolutely needs. Can you imagine if the United States government (or State and city government for that matter) ran as smoothly as our bodies? Exercise not only generates “mechanical loads” it also enhances muscle strength, mobility, balance and overall physical function through your lifespan. All of these benefits also keep you from falling down. Balance is essential to help prevent falls. Balance doesn’t happen because you wish for it. You have to practice balance everyday and your muscles need to be trained in order to maintain your balance. The more “functional” you are the more freedom you will have to do the things in your life that you want to do even at a young age. The MOST EFFECTIVE and LEAST EXPENSIVE preventative measure for reducing the risk of hip fractures is physical exercise. Whether women care to hear this or not, our bodies are different from men’s bodies, so we need to exercise differently as well. The same is true during adolescence. Young female athletes who are training at high volumes and who are not replacing those calories with quality and enough nutrition are at risk for not building their bone supply to capacity. Any female athlete (who is menstruating) that trains at volumes high enough to disrupt her periods to the point where they become irregular (amenorrhea) or to the point where she stops having a period completely (amenorrhea), is increasing her risk of stress fractures and osteoporosis. It is important to note that female athletes with normal menstrual cycles or athletes who are in menopause that are not meeting their nutritional needs, such as calcium and Vitamin D, are still at risk of low bone mineral density (BMD). The right nutrition for female athletes is vital to maintain their BMD. A study by De Souze et al, (1998) observed that even smaller menstrual disturbances like a 31 or 35-day cycles, in comparison to a healthy 28-29 day cycles (eumenorrhea), can cause bone loss as well. I am a huge advocate for girls competing in highly demanding athletic sports. There is just a very important responsibility that comes with that competitive spirit. Competitive females need to take their nutrition very seriously during competitive months. Female athletes need high quality nutrition and they need to eat enough calories for their bodies to maintain their hormones at a level where they are menstruating and to keep building bone. I’m just going to be straightforward here. You need to exercise. There is no miracle serum, food or medication for building stronger bones that doesn’t cause more problems that it claims to solve. What works best is a combination of exercise, nutrition and CONSISTANCY. Women who are sedentary create no reason for bone mass to be developed. Again, the human body is incredibly efficient. Your body gets rid of everything it doesn’t need (accept, of course, for body fat!) If you aren’t creating the demand for bone mass by moving your body, you are not building bone. Exercise regularly (this means 6 days a week for 30 minutes or more plus being active throughout the day) and make sure there is impact like jumping, running, gymnastics, soccer and lifting some heavy things. Quality nutrition including whole, clean, real, nutrient rich food and very little processed food. If your teenager is an athlete and is very active make sure that she is eating enough food to replace the calories she burns during her workouts and throughout her day. If she is burning more calories than she is replacing then she will be losing bone mass too. The eating disorders anorexia and bulimia will wreak havoc on the quality of the development of a young girls bone structure, meaning her bones will develop but they will have less mass and be more brittle. Women with no risk factors for osteoporosis generally will not be able to get a bone density screening test approved by their doctor or their insurance. Although most women won’t experience fractures until they are in their 70’s or 80’s it is suggested by Dr. Christiane Northrup to get a baseline screening before any problems have occurred. There are affordable ways to have your bone density measured if you chose to get a base line measurement. However, understand that bone density tests are a snap shot in time and one test won’t tell you whether your bone density is increasing, decreasing or remaining the same. You will need to do more than one test and the same test is best, for example if you do a heel bone density test your second test should also be a the heel bone density test. The Heel Bone Density Test Although this test is not as accurate as a DEXA scan, it is much less expensive and it could be an early warning indicator if there is a problem. You also do not need a prescription from a doctor for this test. DEXA (Dual-energy bone densitometry) is the gold standard measurement for bone density for both the spine and the hips. Your bone density is measured in this test and then measured on a graph to compare it against “normal” bone densities at a given age. The National Osteoporosis Foundation (NOF) and World Health Organization (WHO) both rate bone density according to a standard curve on which 0 equals the norm (the mean.) Severity of bone loss is then determined by how far a given measurement falls below that mean. DEXA testing requires a prescription from a doctor and is available at most major medical centers. Skin Thickness Testing The thickness of your skin is dependent upon healthy collagen. Accordingly, several studies have found that ultrasound measurement of skin thickness actually helps predict fracture risks almost as accurately as conventional bone density testing. This type of testing is not popular in the United States but may be offered at a medical center in your area so it’s worth asking about. Urine Test for Bone Breakdown Products When bone breaks down it releases a tiny bit of collagen into your urine and this can be measured. Bone breakdown is a normal process and therefore collagen can be found in everyone’s urine. However, if your bone is breaking down at a high rate, you will have more collagen in your urine. You would be essentially peeing out your bones. Not good. These tests do not require a doctor’s prescription and can give you a day-to-day reading of the state of your bone metabolism. This test can be repeated every month to make sure your bone-building program is working. Nutrition is a vital part of the development, for maintaining and even rebuilding your bones throughout your life. Look for Part III of the What You Need To Know About Your Bones series to be posted in the next couple of days. De Souze, et al. (1998). High frequency of luteal phase deficiency and anovulation in recreational women runners: Blunted elevation of follicle0stimulating hormone observed during luteal-follicule-stimulating hormone observed during luteal-follicular transition. Journal of Clinical Enocrinology and Metabolism, 83(12),4220-4232.